This is still one of my favorite drawings of Gerard. Aww thanks! I'm pretty glad! 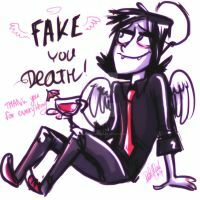 I saw the pic on a MCR group on FB but I didn't see it in his own twitter, where is it from? Yeah he is really cute...! The default display "No replies". and if you switch it to "All", you can see his all replies! well I use witter viw tweetcaster for android I don't know if I have that option but i will check for sure thanks!! Yeah, if you want to check Gee's all Tweet, just bookmark his Twitter page on any internet browser, in the state in which you are logged in to Twitter. (don't via the appli). Probably, it is an easy way! Hehe Glad I could help! you're welcome! Heheheheh I really love it!You did an amazing job! I really was amused by his picture too. Aww :3 Its so cute !!! Waoh really? I'm pretty glad! Ehehe thanks! I'm so glad! Aww really thank you saying so...! For all MCR fan art! !